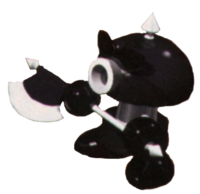 Axem Black is one of the five Axem Rangers and a member of the Smithy Gang who appears in the game Super Mario RPG: Legend of the Seven Stars. Like all of the other Axem Rangers, he fights with a small axe. Additionally, Axem Black commonly utilizes bombs in combat and can attack twice in one turn or occasionally three times. His Psychopath thought implies that he wasn't an actual member of the Axem Rangers, but was trying out for them. After an Axem Ranger is defeated by Mario and his allies, he or she gives an excuse for not being able to fight anymore. Axem Black's excuse is: "I broke my shades!" Axem Red's reply is: "Serves you right!" This page was last edited on December 25, 2017, at 21:29.